A recipe for Brown Sugar Mixed Berry Cobbler, also known as how to survive winter until summer magically appears and we get to indulge in sweet, summer berries once again. It’s cold. It’s still cold. It will be cold for a while longer. I’m so over the cold that I’ve started to pretend it’s not winter anymore, specially with this recipe for Brown Sugar Mixed Berry Cobbler. Because between you and me, I’m missing summer berries hard right about now. Sure, I can grab those packaged berries at the store, shipped all the way from California, but what I want are my local Morning Glory Farm berries here on Martha’s Vineyard. Sweet, small, sometimes tart – and always worth the $6/quart. This is how I survive the winter – I grab a bag of frozen mixed berries from the grocery store, stir them up with cornstarch, a good glup of honey, and a hefty shake of ground ginger. 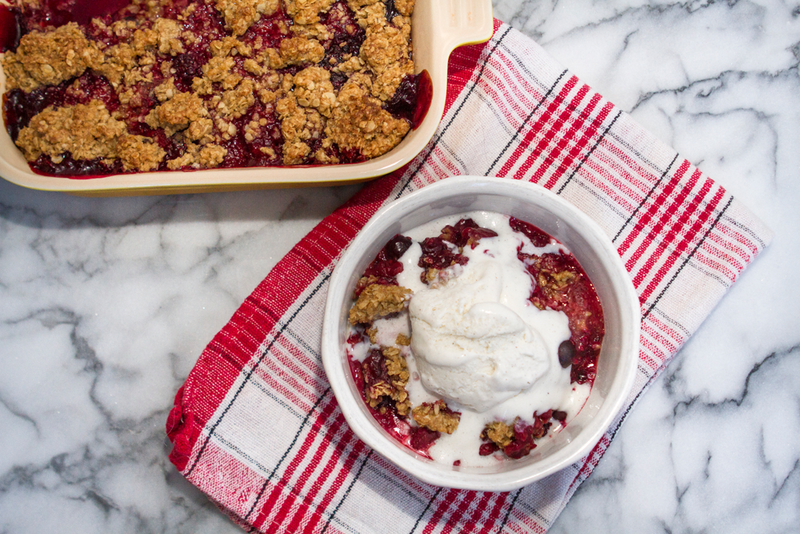 Top that with a brown sugar oatmeal butter crumble and bake until bubbly – the aroma itself will make you think of summer days on the deck eating freshly picked berries. Feeling indulgent? Top with vanilla bean ice cream and let it melt into a small puddle of cream over the hot cobbler. Your friends and family will smile with berry stained lips and thank you. The perfect dessert that comes together in under an hour and when served with ice cream, is everyone's favorite. Preheat the oven to 350F and grease an 8" by 8" pan, set aside. In a large bowl, work the butter into the flour, oats, brown sugar, and salt. Form a cobbler topping that will look like wet sand. In a separate bowl, mix the berries, honey, cornstarch, ginger, and vanilla. Pour into greased pan and top with crumble topping. Bake for 30-40 minutes until bubbly. Serve warm with ice cream or a dollop of whipped cream.